Wagyu Beef Bowl (from $9.90, top), Aburi Barra Chirashi ($16.90, left), Shrimp Karaage with mentaiko mayonnaise ($7.90,right) PHOTO: WAA COW! Taking over the premises of brunch cafe Late Plate is this 40-seat modern Japanese rice bowl cafe. Signature dishes include the Wagyu Beef Bowl (from $9.90), with beef and an onsen egg on Akitakomachi short-grain rice. Seafood selections include Aburi Barra Chirashi ($16.90), which has a tapestry of seafood such as diced salmon, swordfish, octopus and Hokkaido scallops on a bed of sushi rice. Nibble on Shrimp Karaage with mentaiko mayonnaise ($7.90) and deep-fried chicken wings with sweet soy glaze ($7.90). Students and staff from the National University of Singapore get a 10 per cent discount. The well-loved 30-year-old restaurant was set to close in December last year, but Shashlik has re-opened, with new people at the helm. Mr Derrick Tan, 44, who is the son of the late Mr Tan Niap Hin, former head waiter and captain of Shashlik, is running the restaurant. Some long-time waiters will don their trademark bow ties to serve dishes wheeled out on trolleys. 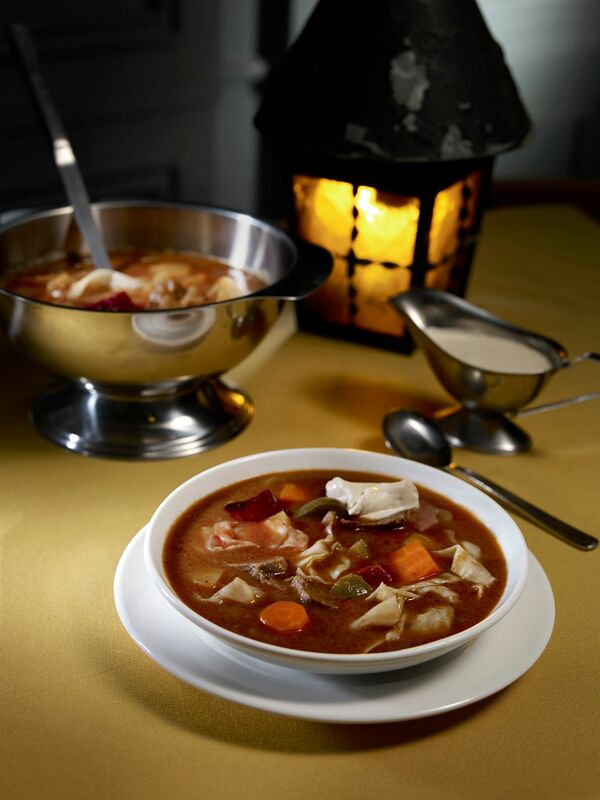 Old favourites include the Borshch soup ($7, photo 2) served with a dollop of sour cream and Shashlik of Beef ($32). For dessert, watch the waiters dish out and flambe signature sweets such as Cherry Jubilee ($20) and Baked Alaska ($24) tableside. This cafe in International Plaza offers toast, hot dishes and drinks. Selections include Haybi Hiam Toast, which is spread with spicy dried shrimp paste; and Keluak Toast, which is slathered with buah keluak paste, made with the pungent Indonesian black nut ($1.80 each). Mains include Ayam Buah Keluak Rice ($6.90), Beef Rendang Nasi Lemak ($6.90) and Assam Laksa ($5.90). Finish with waffles topped with coconut ice cream and drizzled with gula melaka sauce ($4.90) and chendol crowned with coconut ice-cream ($3.50). The cafe is run by the owners of Peranakan restaurants such as Dulukala in Beauty World Centre and O'nya Sayang, which has branches in Paya Lebar Square and Tampines Mall. Home-grown cafe bar Wala Wala has started Hive, a 380-seat bar that also houses a wine retail shop, bakery and restaurant. Its menu, which features a mix of local and Western cuisines, includes dishes such as oxtail stew ($12) and chargrilled honey-glazed pork ribs flambeed with Maker's Mark Bourbon ($36). There is also a selection of 16 skewered meats that start at $2 each for chicken heart and gizzard. It serves draught beers, such as Singha, Hoegaarden White and Asahi Jukusen (from $10 for a pint), and Suntory Kakubin Whiskey Highball ($12). This 14-seat sushi bar offers sashimi, sushi and donburi (Japanese rice bowls). Choose from more than 20 donburi, including an unconventional Japanese-style glazed duck with onsen egg bowl ($14.80) that features smoked duck breast. The crowd favourite is the value-for-money Bara Chirashi Don ($12.80), which is topped with five to eight types of marinated seafood such as salmon, octopus, prawns and tuna. A premium version ($22.80) comes with salmon belly, hamachi, Hokkaido scallops and Japanese amaebi (sweet shrimp).